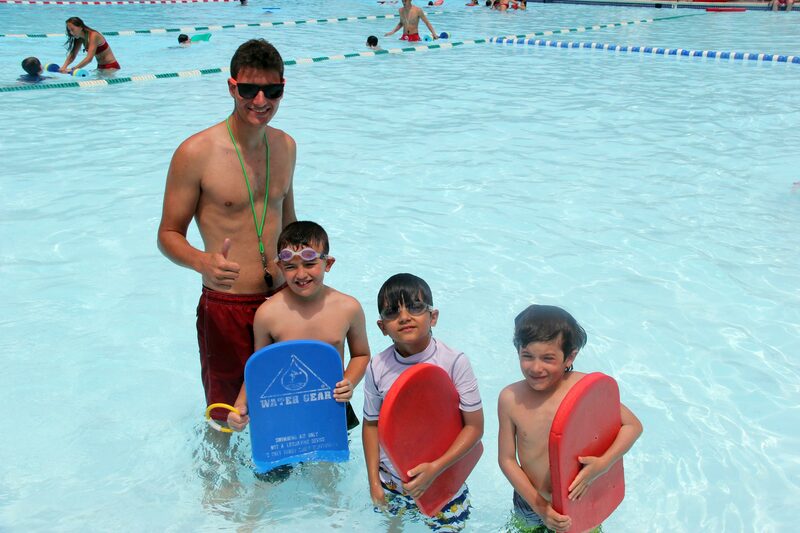 Swimming at SLDC is the cornerstone of our daily program for all of our campers. Learning how to swim and swim well is a life skill that we should all know how to do. We consider ourselves to be a “Swim Camp within a Camp“, offering swim two of the seven periods daily to full day campers and one swim daily for our half-day campers. SLDC understands the importance of offering a state of the art swim facility in order to offer our campers a top quality, progressive swim program. Our 40,000 square foot heated pool complex is perfectly designed for every camper and every swim level, from those who are just getting comfortable putting their faces in the water to those who have developed the skills and endurance to be part of a swim team. It is our goal to teach every camper how to swim with confidence, and to continuously progress and reach new levels of performance according to American Red Cross standards. We are fortunate to have highly skilled and experienced Aquatics Directors supervising our aquatics staff and overseeing all aspects of our swim and boating programs: Louis Drucks, Lakefront and Plake Director; Stephanie Baer, Director of Mid and Upper Camp Aquatics; Ginny Harrison, Assistant Director of Mid and Upper Camp Aquatics; and Sheri Taback, Director of Junior Camp Aquatics. With the combination of outstanding supervision and well trained aquatics staff to oversee our pool complex and lake, we ensure quality water safety as well as a very low camper to instructor ratio per swim instruction group. Daily swim instruction is offered in small swim groups in age appropriate pool areas, which promote personalized instruction, encouragement and ongoing skills assessments. Campers are evaluated on their first day of camp and placed into swim groups according to comfort and ability. They progress to the next level of the American Red Cross Learn-to-Swim Program once they complete the skills necessary for each swim level. Our pools are designed with water depths to accommodate all swim levels, from shallow to deep water swim. Our youngest campers can always feel safe, standing in the water while having swim lessons! Offering 25 meter pools, we are also able to train and improve the endurance for our high group level swimmers and our swim team! Parents receive swim reports every two weeks so they are apprised of their camper’s progress in the water, but can always call at any time during the summer for an update. It is during their afternoon free swim that our campers get to enjoy water play with friends, practice their skills, play games and participate in our amazing choice of pools, slides and Wibit inflatable obstacle course. All campers are required to swim within an arms’ length of their buddy, with buddy checks being done several times during the free swim period. Campers who pass our deep water challenge are identified and can choose to swim in the several deep water areas of our pool complex. SLDC also has our own natural 5 acre spring fed lake where campers can experience a wide range of lake-related activities, including boating, fishing and zipping over the lake. Our lake staff helps campers put on life jackets and instruct them how to safely and effectively utilize the different boating apparatuses. 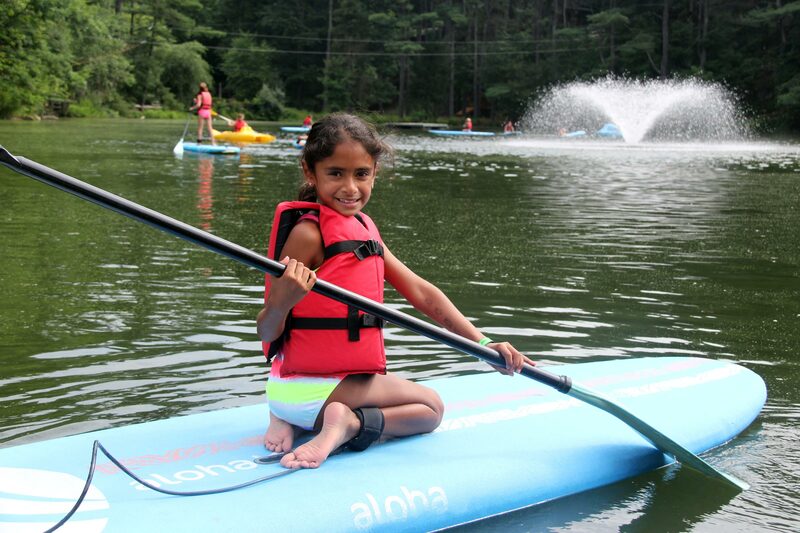 Campers are supervised by the lake staff while they enjoy our new bumper boats area, as well as our paddle boats, kayaks, corcls, paddle boarding, canoes, surf bikes, and even the fountain spray fun in the lake. SLDC is an authorized provider for the American Red Cross, following the American Camp Association and American Red Cross Learn-to-Swim Safety Swim Program as our guide for swim levels and skills assessment. Our facility offers lifeguard certification classes as well as staff training and orientation before the camp season so that our camp may recruit and hire over 50 highly trained and certified lifeguards and instructors. Our Aquatics Directors are always available for questions and concerns to discuss campers’ swim progress at 973-831-9000 or at swim@sldc.com. We look forward to all of our campers having a wonderful summer! Stephanie joined our SLDC family 12 years ago, originally as our Athletic Director, but with her extensive aquatics background with the American Red Cross, she happily joined Elena Klarberg as a Director of Mid and Upper Camp Aquatics ten years ago. She has also been running our successful American Red Cross Babysitting Basics course which so many of our oldest campers love! Stephanie has an M.A. in Athletic Administration from Columbia University and began her professional career at New York’s Columbia Grammar and Prep School coaching Swim and Tennis. She then moved on to be the Athletic Director of the Birch Wathen Lenox School, while continuing her coaching career. She has been teaching Elementary Physical Education in Teaneck for the past 28 years while coaching Tennis, Bowling and Swimming, finding all of her work with children at school and at camp extremely rewarding. Stephanie takes personal pride of all of our SLDC campers as they excel every summer. She and her Assistant Director, Ginny Harrison, make an amazing aquatics department duo! This will be Sheri’s 16th fabulous summer at SLDC! From 2004 to 2009, Sheri was a Junior Pool Lifeguard and Swim Instructor, was a Group Leader for Diamonds and Opals in 2010 and 2011 and then returned to her love of the pool, to be the Junior Pool Director in 2012. Of course, she is a certified lifeguard and Water Safety Instructor! Although Sheri’s professional background is in business management and marketing with a degree from Cornell University, she also considers herself to be a “professional volunteer” in her community. Sheri has been a camper all of her life and feels “lucky to still be one in my adulthood!” WE are lucky to have her bright smile, energy and leadership on our SLDC team for so many years! • Read a message from Sheri Taback. Ginny first joined our SLDC family in 2001. For 10 years she enjoyed being a lifeguard and swim instructor to so many of our campers. After a short hiatus, she was enthusiastic about returning to Spring Lake Day Camp in 2017 as Assistant Director of Mid and Upper Camp Aquatics alongside Stephanie Baer. Together they make a great team ensuring the success, enjoyment, and safety at the Big Pool. As a competitive swimmer all of her life, Ginny brings extensive experience in swimming skills, aquatic fitness, and water safety skills. Ginny has a B.S. in Exercise Science, Kinesiology, and Health from William Paterson University and has been a Physical Education and Health teacher of elementary and middle school aged children for the last 9 years, most recently in New Brunswick. Teaching movement skills and a love for physical activity is a passion of hers that she brings to our campers every day through our amazing aquatics program!